InsideARM gives kudos to ContactRelief for Hurricane Harvey response. 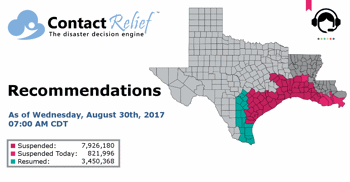 ContactRelief recommends resuming contact with consumers in certain counties along the northern edge of the Texas the Harvey impact zone. As Harvey is downgraded to a tropical depression, the storm is expected to produce heavy rainfall over Arkansas, Tennesee, and Kentucky and surrounding regions. ContactRelief recommends resuming contact with consumers in certain counties along the northern edge of the Texas the Harvey impact zone and certain parishes in Louisiana. Additional counties in Louisiana should be suspended as Harvey makes second landfall near Cameron, Louisiana. 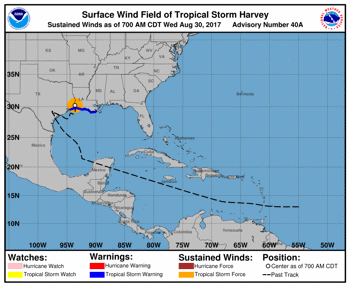 Tropical Storm Harvey made landfall for the second time early Wednesday morning near Cameron, Louisiana. Contact resumption recommended for some southwestern Texas counties that escaped the catastrophic devastation caused by Hurricane Harvey. ContactRelief Meteorologist Dr. Kevin Levey examines Hurricane Harvey in this 2 part series that every risk manager and contact center professional should read. Contact suspension recommended for parishes in southwestern Louisiana and counties in southeastern Texas as a result of continued rainfall and flooding conditions from Tropical Storm Harvey.